The Zeckendorf Towers building, also called One Irving Place and One Union Square East, is a 645-unit, 29-story, four-towered mixed-use condominium enclave on the eastern side of Union Square. Completed in 1987, it was designed by architectural firm Davis, Brody & Associates, and named in honor of prominent American real estate developer William Zeckendorf. It was one of New York City’s most important development projects of the 1980’s. The distinctive four-tower, pyramid-topped, building is a common site to all who are familiar with the area. The building features landscaped roof gardens and courtyards, a full-service health club, and a sky lobby supplementing the services provided by the street level concierge. Zeckendorf Towers was first opened for occupancy in 1987 and is credited with initiating the revitalization of the Union Square area. Maxwell Kates’ on-site staff has been managing the building since 1991. The 14,000 square feet of outdoor space on the building’s seventh floor makes up the largest residential green roof in New York. The roof was transformed in 2010 as part of Mayor Michael Bloomberg’s NYC Green Infrastructure campaign. The planted roof also serves to capture some of the rain that falls on it rather than letting it run off and contribute to flooding in the Union Square subway station below it. Our full-service health club features a main workout area, a separate space where cutting-edge classes such as Tai Chi, Kickboxing & Yoga are offered, state of the art cardio equipment including Peleton Bikes and a Woodway Treadmill as well as a lap pool. 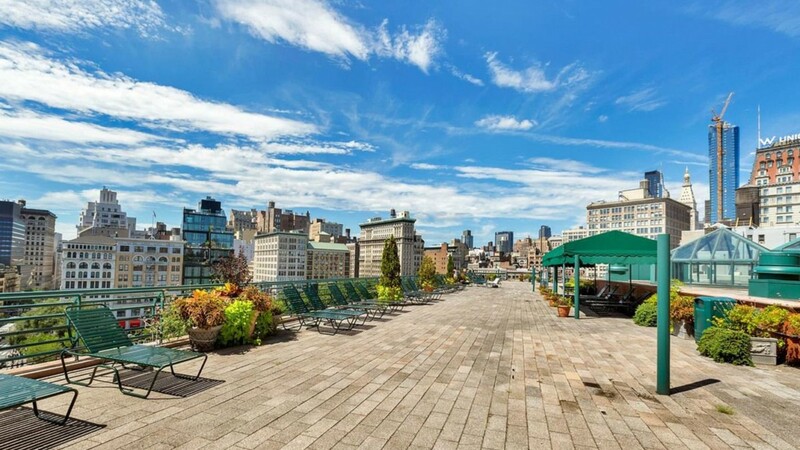 You may also visit the 7th-floor sun deck for some relaxation and spectacular views of Union Square.